When I was in school, I read a lot of blog articles and listened to a lot of lectures that told me “how to make it” once I was done with school. Last week, there was a fantastic Klout Chat on Twitter that dove into this subject, so some of my advice here is loosely based on the comments I read and contributed myself. First, what is your personal brand? Put simply, it is your personal and professional representation that people can see both online and offline. Specifically, your personal brand comes down to the writing you publish, the things you post on social media, absolutely everything on your website and how you communicate with anyone and everyone. Your personal brand is a combination of what you’ve done, what you’re doing and what you’re saying. Unfortunately, you’re likely going to slip up while building your personal brand, at least at first. That’s why you should get started now. Learn how to brand yourself through experience by putting yourself out there and steadily improving your portfolio. 2. NETWORK WITH NEW PROFESSIONALS. Go beyond finding a mentor and start making friends with people who are a few years ahead of you. Learn from them and have discussions via Twitter, LinkedIn and email. Many of these new pros will love to make the connection. You can even land a great job this way. Today’s new professionals are tomorrow’s references or even employers. Your chances of landing a great job are strengthened by the genuine connections you’ve been cultivating. 3. FIGURE OUT YOUR NICHE. Notice I didn’t say settle on your niche. You don’t need to have your entire career trajectory written in blood, but you should start making an effort into discovering what you’re good at it and how it can be an asset to future employers. I pinpointed my niche, writing, through internships and blogging. Blogging helped me discover that I loved to write, and it was suitable practice for the road ahead. Internships, on the other hand, taught me how to leverage this skill as a value to businesses. While you’re in school, practice the different skills that are in front of you and start working towards making that niche a professional skill you can see yourself becoming an expert in. 4. HAVE AN IDEA OF WHERE YOU WANT TO GO. 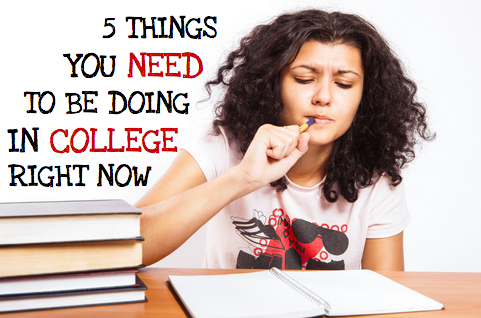 Start thinking about the places you can see yourself living in after you graduate. You don’t have to make a decision, but familiarizing yourself with where you want to transition will help ease the pressure of your job search. In other words, taking the uncertainty out of the location makes the uncertainty of finding/keeping a job more manageable. For example, you could make this decision by applying to jobs all over the country during your senior year in order to secure an employer for graduation. The problem with doing this is that if a company does want to interview you, you have to spend resources into going there, and you may be rushed into a decision. Instead, consider making a list of cities you want to work in. Your first decision is whether or not you want to live in a big city or a small town. Once you have a good idea, start researching these cities and see which ones really stick out to you. 5. RESEARCH YOUR DREAM EMPLOYERS. Now that you have a basic idea of where you would like to live, start considering where you would like to work. Again, you’re not making any final decisions here. You’re just shopping. Maybe you like the idea of living in New York City, but you discover that the jobs are pretty competitive, and the living expenses are too much. So you move on to other cities like Boston, where you may have family nearby. You may even discover that there is a company right outside of Boston that is pretty attractive to you. When it comes to your career aspirations, nothing is wrong with being a dreamer. Even if you’re not serious about working for, let’s say, Google, you can still look into the big companies and what they require for entry-level workers. Once you have a list of the organizations you would love to work for, start researching them. Learn about where they came from, what they’ve done, what the world thinks about them and what their culture is. Now that you know them better than a few employees probably do, start communicating with them (by now, you should know the language.) Talk to them about potential internship opportunities and make connections with the people who work there, even if you’re rejected. Being persistent might reward you with a stellar job opportunity down the road, and all you had to do was be friendly and prepared. Have something to add to the list? Let me know! 1 OUT OF 5. BUFFERING………………….